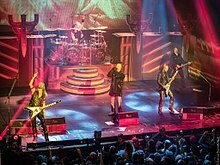 Judas Priest performing at the Warfield Theatre in San Francisco on 19 April 2018, as part of the Firepower World Tour, which featured Andy Sneap filling in for Glenn Tipton on guitar. In a November 2015 interview with Reverb.com, Richie Faulkner said that the band would start work on their eighteenth studio album in 2016. In April 2016, Loudwire posted a photo showing Rob Halford, Glenn Tipton and Faulkner himself in the studio beginning the process of the album, with Halford confirming in a radio interview that it would be ready by early 2017. During an interview at the 2016 edition of the Rock 'n' Roll Fantasy Camp, Halford expressed dissatisfaction on making an album similar to Redeemer of Souls. Faulkner then stated that the band would begin recording in January 2017 and also said that they would not go on tour until 2018. In March 2017, the band entered the studio to begin the recording process, with support from long time producer Tom Allom, along with former Sabbat guitarist and producer Andy Sneap and engineer Mike Exeter, who worked with the band on the previous album. This marked the first time since 1988's Ram It Down that they had worked with Allom. In an April 2017 interview with Planet Rock, Halford said that the band was "coming to some of the final moments" of completion of the new album. He also promised "a very exciting 2018 period" with a world tour taking place in 2018. In an Instagram post in June 2017, Sneap said that the band completed tracking. On 29 January 2019, Judas Priest's European tour with Ozzy Osbourne was cancelled due to Osbourne experiencing a severe upper-respiratory infection. The band later confirmed that the tour was rescheduled to 2020. 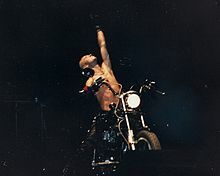 In a March 2019 interview with Australia's May the Rock Be With You, Halford stated that there would "definitely" be a nineteenth studio album in the future. He later said that Tipton had already started composing riffs. Bassist Ian Hill said that the band has "some very strong ideas that were left out of Firepower which we never got around to completing. So it's very much on the cards. When that will happen, I don't know." ^ Hicks, Bill; Lahr, John (2004). Love All the People: Letters, Lyrics, Routines. Constable & Robinson. ISBN 1-84119-878-1. Retrieved 20 April 2015. ^ Darus, Alex. "OZZY OSBOURNE CANCELS ENTIRE EUROPEAN LEG OF TOUR DUE TO HEALTH ISSUES". Alternative Press. Retrieved 29 January 2019. ^ "JUDAS PRIEST Confirms It Will Be Part Of OZZY OSBOURNE's Rescheduled European Tour In 2020". Blabbermouth.net. Retrieved 7 April 2019. ^ Kaufman, Spencer. "Rob Halford: Glenn Tipton is already writing riffs for next Judas Priest album". Consequence of Sound. Retrieved 19 April 2019. ^ Altaf, Rodrigo. 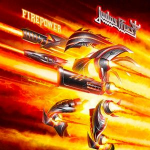 "IAN HILL of JUDAS PRIEST on the Follow Up to Firepower: "We Have a Lot of Unused Material that Was Very Solid and Could End up on Our Next Album"". Sonic Perspectives. Retrieved 23 April 2019. ^ a b c d e f g "JUDAS PRIEST nominated multiple times for the 4th Annual Loudwire Music Awards". JudasPriest.com. 8 January 2015.